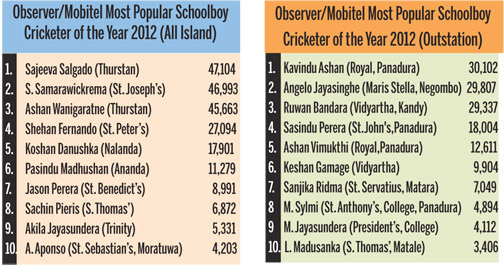 Thurstana’s Sajeeva Salgado (47,104) ousted Josephian Sadeera Samarawickrema (46,993) to the second place with a majority of 111 votes in the Sunday Observer/Mobitel Most Popular Schoolboy Cricketer of the Year Contest (All-Island) at the end of count No.14. In the Outstation Contest too, there is a close tussle between Kavindu Ashan (30,102) and Maris Stella’s Angelo Jayasinghe (29,807). Kavindu Ashan who was placed second last week climbs to the top with a majority of 295 votes.